We’d love your help. Let us know what’s wrong with this preview of The Expanse by J.M. Dillard. High above the planet Earth, an alien probe appears -- and in an unspeakably horrific instant, releases a deadly blast that strafes the planet's surface, leaving a miles-wide, smoldering crater of destruction in its wake. Millions die in Florida, Cuba, and Venezuela, their lives blotted out in a blazing millisecond. Just as swiftly, the probe implodes and crashes on the pl High above the planet Earth, an alien probe appears -- and in an unspeakably horrific instant, releases a deadly blast that strafes the planet's surface, leaving a miles-wide, smoldering crater of destruction in its wake. Millions die in Florida, Cuba, and Venezuela, their lives blotted out in a blazing millisecond. Just as swiftly, the probe implodes and crashes on the planet surface, but the remnants provide no clue as to its origin. Who are the attackers, and what provoked them? Aboard the Starship Enterprise™, Captain Jonathan Archer learns of the destruction. His ship is called home; it is uncertain whether its mission of space exploration will continue. But before Enterprise reaches Earth, Archer is abruptly kidnaped from the bridge by the time-traveling enemies he has encountered before. He finds himself aboard a Suliban vessel, face-to-face with his old nemesis, Silik, a high-ranking indiviual in a battle known only as the Temporal Cold War. Silik leads him to his master, a mysterious humanoid from the far future. The humanoid claims that the attack on Earth was just a test; and the next attack will destroy Archer's home planet...unless he and the Enterprise crew stop it. To do so, they must enter a region of space called The Expanse - an area so dangerous that no ship has ever emerged from it unscathed. Vulcan crews were driven to bloodthirsty madness, Klingon crews were anatomically inverted, their internal organs exposed outside their bodies...while they still lived. Many vessels were lost, never to be heard from again. To ask other readers questions about The Expanse, please sign up. 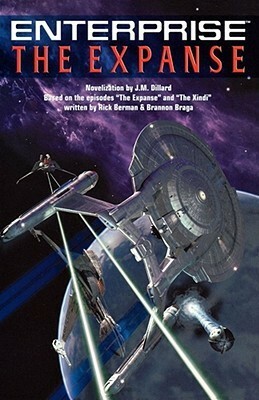 A good novelization from when Enterprise started getting good! The "problem" with adapting two episodes of the series into one adventure is they don't naturally go together. Yes, this is a continuing story and one follows the other. However, The Expanse has a definite end point and The Xindi begins a soft reboot for the series. You can see where those two episodes end and begin in this book. That being said, just enough is added to this story to make it different from the series. There is more emotional stakes here than in the show; we get to see and hear th The "problem" with adapting two episodes of the series into one adventure is they don't naturally go together. Yes, this is a continuing story and one follows the other. However, The Expanse has a definite end point and The Xindi begins a soft reboot for the series. You can see where those two episodes end and begin in this book. That being said, just enough is added to this story to make it different from the series. There is more emotional stakes here than in the show; we get to see and hear the fall out from the Xindi attack...we get to feel it. "The Expanse" by J.M. Dillard is a novelization of two Star Trek Enterprise episodes; namely the Season 2 Finale and the Season 3 premier. There was one little quirk regarding this novelization though in that it actually included various scenes that were deleted from the episodes prior to them airing which were quite interesting to read. The story deals with an attack on Earth by a previously unknown alien species (or actually 5 separate species that evolved on one planet) known as the Xindi. Aft "The Expanse" by J.M. Dillard is a novelization of two Star Trek Enterprise episodes; namely the Season 2 Finale and the Season 3 premier. There was one little quirk regarding this novelization though in that it actually included various scenes that were deleted from the episodes prior to them airing which were quite interesting to read. The story deals with an attack on Earth by a previously unknown alien species (or actually 5 separate species that evolved on one planet) known as the Xindi. After this attack leaves millions dead, the Enteprise is recalled to Earth where the crew witness the devastation for themselves. However, thanks to information gained from a time traveller, the Enterprise is dispatched on a mission into the Delphic Expanse to try and locate the Xindi homeworld to ensure there are no further attacks. The book follows the script of the two episodes fairly well, covering the various events exactly as was seen on screen although the reader does get to obtain a little bit more understanding of what may be going on within the character's heads and the various motivations. I particularly thought this was so in regards to T'Pol's decision to disobey the Vulcan High Command and Tucker's attempts to deal with the loss of his sister. My biggest issue with the novel though is that it just covers the two episodes that were used to set up a major story arc that ran across the entire third series. Therefore, there is no satisfying conclusion to this novel which basically just sets up the major plot line and various goals yet doesn't actually see them through to completion. To be honest, if I hadn't been the fan of the series and therefore knew how it all ends up I would probably have been deeply disappointed. If you ignore this aspect however, there is no doubt that this is a well written and nicely paced book. The story itself was enjoyable enough already, but the little additions made by Dillard to the story have definitely added to it. It is without doubt the best of the novelizations I have read so far within the Enterprise collection. Another straightforward novelization from J.M. Dillard, sticking mostly to the script, with some insight into the characters' heads that was much appreciated. I particularly enjoyed her takes on Phlox, Trip, and T'Pol, though of course I'm biased toward Trip. Especially in this story - oh, the angst! This review has been hidden because it contains spoilers. To view it, click here. Good book and and quite gripping, however it leads you to an abrupt end. I was very disappointed at this because that's what the author was leading you towards throughout the book! I thought the next book in the series may be the follow up, but it wasn't. It was - in fact- three books later. I believe the book was well written. I do remember seeing both series the book is constructed from, but I will have to see both episodes in its entirety to catch any differences. For we all know the book and story television is two different things. ... although it would nice for 'someone' to write some other episode novelizations, to carry on this story.